Joy Harjo will be participating in Speaking in Languages on the Edge and Obsession: Joy Harjo on Time in the 2013 PEN World Voices Festival. Joy Harjo burst onto the international literary scene with the publication of her first book of poetry, She Had Some Horses, in 1983. Her poems offered strong and original lines, rhythms, and images honoring plants, animals, the sun, and female ferocity. For more than thirty years, Harjo has been sending forth words and images and sounds, writing and performing poems, prose, music, theater, and chant, continuing to break new ground. Jane Ciabattari: What would you want the international audience at this year’s PEN World Voices Festival to know about your heritage and the history of the Mvskoke (Creek) Nation? The meaning of the name Harjo, for instance? Joy Harjo: The name Harjo means, “so brave you’re crazy.” There are many, many Harjos. Some of us are related, some not, though I’ve found that most of us in the tribe are related somehow, if not by blood, by clan, marriage, or story. When I’ve traveled to other countries to perform poetry, literature, or music, the audiences seem to have the most trouble with the notion that a nation can exist within a nation. There are over five hundred indigenous nations in just the U.S. And there is no such thing as “Native American,” such as a “Native American” language or culture. We are many languages and cultures, much like European or African countries and/or tribes. Our music varies. When you listen to Mvskoke tribal music you can hear one of the roots of blues and jazz. We are part of the origin of that music, but have not been included in the story. JC: What literary themes, forms, and perceptions do you draw from your lineage? JH: Colonization is one of the first confrontations for any of us. Who are we before and after the encounter? And how do we imagine ourselves with an integrity and freshness outside the sludge and despair of destruction? I am seven generations from Monahwee, who, with the rest of the Red Stick contingent, fought Andrew Jackson at The Battle of Horseshoe Bend in what is now known as Alabama. Our tribe was removed unlawfully from our homelands. Seven generations can live under one roof. That sense of time brings history close, within breathing distance. I call it ancestor time. Everything is a living being, even time, even words. JC: What are you reading at the opening night event at Cooper Union, which is on the theme of “Bravery?” How is “bravery” particularly relevant to your work and your past? JH: I am reading one poem, “No,” and singing the poem “Equinox,” Both deal with war. “Equinox” more with the internalization of the memory of violence. I don’t feel I’m particularly brave but I have been at the edge of many precipices in my life and made difficult choices. I have not always done so gracefully. I come from a brave people, from people who stood up and continue to stand up with dignity. It’s not easy being Mvskoke or any other tribal person in this so-called postcolonial world. There is no “postcolonial”—colonization has morphed into corporatization. JC: What will you be reading on Wednesday, May 1, at Joe’s Pub’s in the “Speaking in Languages on the Edge” event? JH: I will be singing one of my poems in the Mvskoke language, and reading a new poem by the Navajo poet Sherwin Bitsui, in Navajo. I began learning to speak Navajo in the seventies, just as I was learning to write poetry. My early poems especially have a kind of sensibility that I took in from that language. I am learning my Mvskoke language by writing songs with it. Many of the songs on my last album, Red Dreams, A Trail Beyond Tears, are in Mvskoke. (It’s available on CD Baby and iTunes.) There are many efforts by tribal nations all across the country to revitalize and speak our indigenous languages. Hawaiians have inspired many of us. Along with their language resurgence came cultural growth and community empowerment. JC: You’re at The Standard East Village on Friday night to talk about your interest in the depth, scope, and passage of time. Can you give a preview? JH: I have experienced time as a being, a person with many heads, arms, legs and feet. It is everlasting yet is absolutely present. It is a tricky being. I have it in my grasp and it slides away. Once I was able to ride it, like my grandfather who was a horseman, and rode time a long distance in a few minutes that was impossible in strict, linear clock time. Once I saw time meander then snap back into place in an ordinary room. I have also walked through time and with time, across many stories. My mother said her mother used to dream novels, then relate the stories to the children to get them to bed to sleep. I often dream through other stories in other times and places, some not of this world. 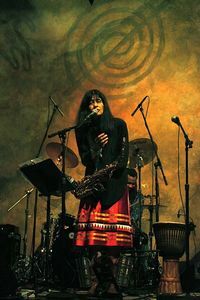 Joy Harjo’s home base is in the Mvskoke (Creek) Nation in Oklahoma, in Glenpool, just south of Tulsa. But she is, like quicksilver, always on the move, living on the road, shimmering and dancing and throwing out stories and ideas. She was recently at UCross in Wyoming, on a Sundance Theater Residency. She is teaching this semester as a professor in the American Indian Studies Program at the University of Illinois, Urbana-Champaign. On her birthday, May 9, shortly after PEN World Voices, she will be driving to New Mexico, to give a commencement speech at the Institute of American Indian Arts, and to see her daughter graduate from University of New Mexico with a degree in Creative Writing. She’ll be giving a keynote speech in New Orleans at the end of May at the National Conference on Race and Ethnicity. She performs steadily, and is working on a play entitled We Were There When Jazz Was Invented.